We woke up to 12 inches of snow this morning. What a gorgeous sight! 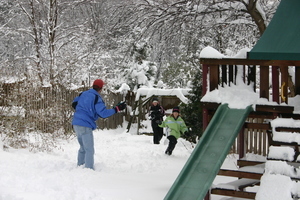 Here is a picture of my three favorite people having a snowball fight. For those of you around here or somewhere else in the Northeast, I hope you enjoyed this snowy day as well!